Each formatting style is a set of predefined formatting options: (font size, color, line spacing, alignment etc.). The styles allow you to quickly format different parts of the document (headings, subheadings, lists, normal text, quotes) instead of applying several formatting options individually each time. This also ensures a consistent appearance throughout the entire document. A style can be applied to the whole paragraph only. select the needed style from the style gallery on the right at the Home tab of the top toolbar. The following formatting styles are available: normal, no spacing, heading 1-9, title, subtitle, quote, intense quote, list paragraph, footer, header, footnote text. Apply the necessary style to a paragraph. Select the paragraph text and change all the formatting parameters you need. or select the edited text passage with the mouse, drop-down the style gallery, right-click the style you want to change and select the Update from selection option. Once the style is modified, all the paragraphs within the document formatted using this style will change their appearance correspondingly. Format a text passage as you need. or select the edited text passage with the mouse, drop-down the style gallery and click the New style from selection option. 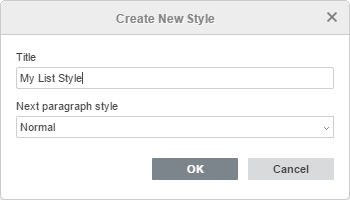 Specify the new style name in the text entry field. Select the desired style for the subsequent paragraph from the Next paragraph style list. The created style will be added to the style gallery. To restore the default settings of a certain style you've changed, right-click the style you want to restore and select the Restore to default option. 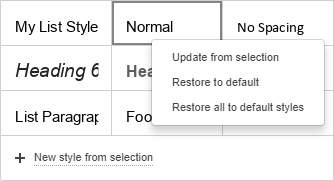 To restore the default settings of all the styles you've changed, right-click any default style in the style gallery and select the Restore all to default styles option. To delete one of the new styles you've created, right-click the style you want to delete and select the Delete style option. 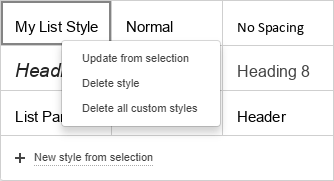 To delete all the new styles you've created, right-click any new style you've created and select the Delete all custom styles option.